New Notice of Commencements were put up today, but first let's check in on what we reported on a couple weeks ago. Remember this post about the Jungle Cruise? Well, we have some movement on this front. 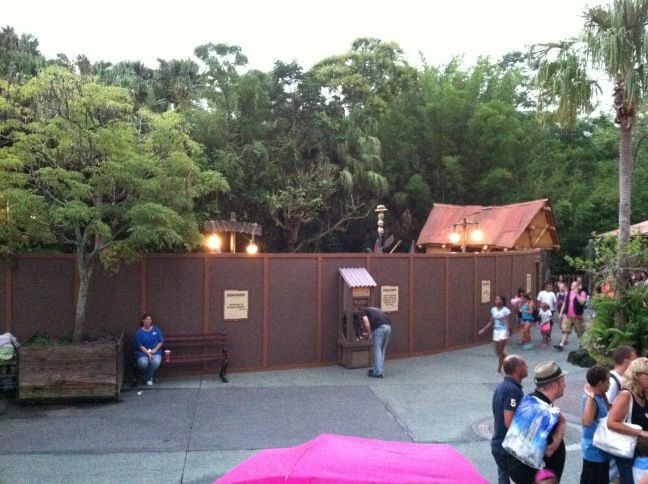 As you can see from this picture from @EPCOTCitizen, you can see that Shrunken Ned's Junior Jungle Boats have been encased by a work wall. I've been told by @ProgressCityUSA that the boats will be removed permanently, but it's unknown what will be done with the area at this time. What could this mean for the big refurb rumored to happen next year? Well, if the rumored expansion does indeed happen, we can expect to see Jungle Cruise boats flowing by this area to make the trip around the Swiss Family Robinson Treehouse. We'll have to keep an eye on the area when the walls come down to see if any substantial work has gone on. On the notice of commencement side of things, some turned up today for a few refurbs. A few came through for the Coral Reef restaurant and kitchen, as well as the Contemporary monorail station. But I wanted to focus on two of the more interesting ones. The first is for "Pilings" at Fort Wilderness. Not sure what it's for. The picture below it had the first word blurred out and just said "Refurbishment" after it. The second is for Test Track. I find this one interesting because the contractor is Show Systems Integrators, which is the company that did the A/V and lighting package for Rip, Ride Rockit, and The Simpsons Ride over at Universal. That's all for tonight, true believers. As always, be sure to follow @Parkscope for up to the minute details. Rumor: Something Big on the Horizon for WDW?